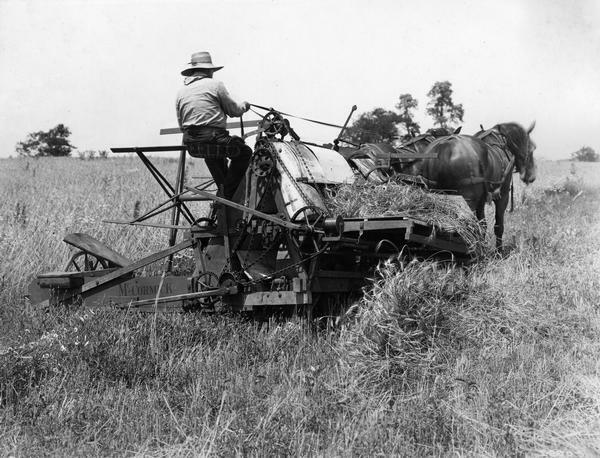 Farmer harvesting grain with horse-drawn McCormick harvester and wire grain binder built in 1876. The scene is likely a historical re-enactment - possibly created in conjunction with International Harvester's "reaper centennial" celebration. Original caption reads: "The wire binding attachment consisted mainly of two steel fingers which moved back and forth and twisted a wire band around each sheaf of grain. This machine did the cutting and binding in a single operation, requiring but one man to drive the team. McCormick built and sold 50,000 wire binders between 1877 and 1885."